Designs by Lisa Somerville: Christmas Chocolates - YUM! I took a break from holiday card creating - yes, I'm finishing my Christmas cards, to make some holiday treats! I'd love to say these chocolate ﻿goodies are gifts, but alas they don't last long in my house! 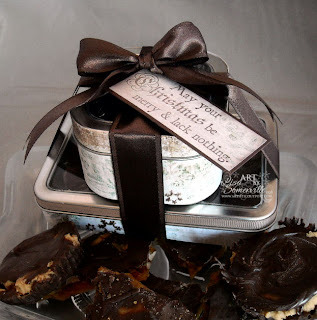 I made some Chocolate Peanut Brittle and Chocolate Peanut Butter Cups, adding them to some decorated tins. Let's just say I made a batch of the Peanut Butter Cups and as of this photo there was only 4 left. DH said to save the recipe! Delicious... swap that out for the fudge. LOL! Beautiful tins! You can't go wrong with peanut butter and chocolate! Thanks for sharing, Lisa! Those wouldn't have lasted long in my house either-yummy! They are such beautiful gifts! (DH and I made peanut butter balls yesterday and DH dipped them in chocolate today....I have two batches of Christmas cookies in the fridge to bake tomorrow. We haven't done this for years!) Merry Christmas, Lisa! You have got to be kidding me!!! My two favorites and you are so teasing me! Those look beyond yummy!!! Beautiful gift!! !